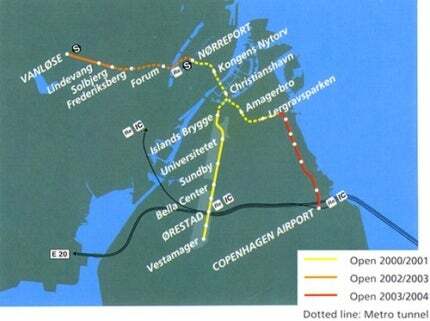 Route map of the Copenhagen metro network. Ansaldo Trasporti built the trains for the Copenhagen metro. The futuristic face of rapid transit in Scandinavia. Underground surveying and navigation methods are based on laser technology. A model showing an elevated station with a cross section. The cut-and-cover section of metro line squeezing past the original Fredriksburg Station. Platforms are monitored via CCTV from each station's control room. Excavation works for the station box of the city centre station at Kongens Nytorv. The train front and cross section. The 34 three-car trains were designed in Italy by Giugiaro. A cross section of elevated track and station. An artist's impression of the elevated station in Orestad. Although initially just two routes through the city centre, west-east and west-south towards the city’s airport, the next decade could see massive expansion with a circular city centre route and two other branches radiating off to Gladsaxe Bronshoj in the north west and SV-Kvarteret in the south west. An important source of business on the initial system is Ørestad, a major development area, consisting of several large complexes of shops, offices and new homes. The daily ridership in 2011 was 54 million passengers. "The daily ridership forecast for 2010 is 257,000 passengers." Ørestad Development Corporation was formed in 1993 to oversee development south of the city centre at Amager, alleviating growing pressure on the more sensitive and historic areas of Copenhagen. Under 55% ownership of the city’s municipal authority, and the remaining 45% in the hands of the Danish government, the company has three members of each on the six-strong board that exercises day-to-day control. The Corporation’s small size is designed to encourage it to make maximum possible use of outside expertise and consultants in the specialist aspects of the metro and other development projects. The use of already proven components limits the risk. For its first five years, the system was run by Metro Service, a new company that was created in 1998 as a joint venture between ATM (Aziende Transporti Milanese) and Ansaldo STS. In January 2010, this contract was extended and Metro Service will continue to operate the line until 2015. The first three stages of the Metro together make up 21km, with 12km of the track above ground. The Metro system complements, and in part replaces, the previously overstretched S-tog heavy rail commuter network. Line M1 (Green) runs from Vanlose to Vestamager, via the city centre and Ørestad. The south-eastern branch from Vanlose to Lergravsparken, and from 2007 to the airport, known as M2 (Yellow), branches off at Christianshavn. Most of the stations are to a standard design, 61m long and 20m wide. Despite the depth of the underground stations, skylights allow natural light to filter through to the platforms. All stations have elevators and escalators to street level and, as a safety measure and to give better temperature control, platform edges are screened by sliding glass walls opening automatically as a train stops at the platform. The operators view platform screens as a significant contributor to maintaining service schedules. Each station has a control room for staff to monitor the platforms, and space to access and exit the trains. Interchange with the city’s S-tog system is at Norreport, while an important central station is located at Kongens Nytorv, the historic central square, close to the main shops, theatres and other attractions. Denmark and Sweden have been historically reliant upon ferry connections with countries to the south. This situation has been improved through the creation of fixed road and rail linksm, such as the bridge-tunnel crossings of the Great Belt within western Denmark (opened in 1998) and the Øresund bridge between Malmo, Sweden and Copenhagen, Denmark (opened in 2000). Ansaldo has supplied 34 trains, while not requiring a driver, carry staff on board to attend to passengers. The trains have a clean, modern design, with large areas of glass for both control staff and passengers. The input of the world-renowned Giugiaro design house is apparent in the futuristic look achieved, with minimal intrusion on the bodyshell by propulsion or other mechanical or electrical equipment. Each unit comprises three articulated cars, with wide aisles and sliding doors for ease of access. It has seats for 96 passengers, with standing room for 204 more. Each car has six sets of automatic double sliding doors. Call points from which passengers can communicate with the main control centre have their positions interlinked with on-board cameras. Four ‘flex’ zones provide general-purpose open space for wheel chairs, pushchairs and bicycles. Trains operate 24 hours a day at weekends, with headways as short as 90 seconds at peak times. The maximum design speed is 80km/h (50mph). The trains and the system have proven to be a model for other systems, notably in the relaunch of the troubled Thessaloniki project in northern Greece. The control and maintenance centre is in the southern area of Ørestad, including stabling facilities for trains. Here they undergo regular routine examinations and maintenance, and cleaning. In common with much of the system, some of these processes are carried out automatically. Movements are controlled and monitored by a three-element automatic train control system. Train movements are based on fixed block sections, where a train is prevented from entering a section already occupied by another train. However, on approaches to stations, a ‘floating’ block system is used, which allows the headways between trains to be reduced to help meet peak-hour demands. Control room staff monitor the network using an Automatic Train Supervision (ATS) system. This gives them up-to-date data on the running status of each train, and logs details of alarms, faults and other unexpected occurrences. Onboard passenger information includes next stations, interchanges with other public transport modes and identification of system delays. Metro uses the same tickets, ten-trip cards and season tickets as greater Copenhagen’s buses and S-trains. The 5km extension from Lergravsparken to Copenhagen (Kastrup) Airport, the busiest in Scandinavia and a major employer in the region, opened in 2007. Already served by trains at 20-minute intervals in each direction between Copenhagen and Malmö via the Öresund fixed link, the Metro’s operation to the airport provides a four-minute interval service, taking 14 minutes from central Copenhagen. "In summer 2007 parliamentary approval was given for Metro City Circle Line (Cityringen)." In summer 2007 parliamentary approval was given for Metro City Circle Line (Cityringen). The designations for the route will be M3 and M4, having the possibility of branching onto future extensions. Including some shared with other lines, the new wholly underground route will have 17 stations, and like the first two lines, will largely serve areas not already covered by heavy rail services. Scheduled opening for Cityringen is December 2018.The total cost of construction of the project is expected to be DKK 21.3bn ($27.15bn). In October 2007 Ramboll and Atkins won a DKK15bn ($2.6bn) contract for providing consulting services for the Cityringen project. The construction contract for the project was awarded to Copenhagen Metro Team joint venture consisting of Salini Costruttori, Tecnimont and S.E.L.I Società Esecuzione Lavori Idraulici in January 2011. Ansaldo will supply the trains and control systems for the project. The company will also be responsible for operation of Cityringen for the first five year. A joint venture of HOCHTIEF (40%) and Züblin (60%) was awarded a €150m contract in June 2014 to construct a 3.5km tunnel and a new subway station at Nordhavn. The scope will include construction of two tunnels of length 1,800m and 1,600m, as well as a small tunnel, ramp structure, and a pedestrian transfer tunnel to the existing S-train urban rail station at Nordhavn by 2019. The Nordhavn metro will branch off from the Cityringen subway. Arup and Ramboll are providing architecture, station design, construction planning and other services for the metro.